It is through superior office design that a fluid, healthy, and productive work culture can be fostered — one wherein the value of relaxation and union are both recognized and leveraged, and where work, in its motley forms, is given the correct support needed to flourish. The debate on whether ‘open’ or ‘closed’ design lends best to this flourishing work has finally bred a new vision for the approach: borrowing elements from both styles for a flexible office space that adapts. The principles core to this pursuit of flexible space, together, embody what we now call ‘flexible office design’ — a philosophy of design comprised by a tactical and artistic mixture of elements from both ‘closed’ and ‘open’ office floor plans. It is through this approach, with ‘flexibility’ set as the lodestar, that office space can be transformed from a cost into a competent and capable asset, delivering on its primary task of embracing workers in realizing their potential. What is flexible office design? Flexible office design, sometimes referred to as multispace, hot-desking or hoteling, agile, non-territorial, activity-based, or task-oriented, is a philosophy with a goal of maximum flexibility. Through strategic and creative inclusion of custom-designed, modular and adjustable furniture, equipment, and technology, ‘flexibility’ is built right into the floor plan. This flexibility, first and foremost, is so that each individual worker is empowered and enabled to find their focused workflow just as easily as they can find energizing collaboration with colleagues. And, secondly, so that the company, as a collective, can adapt to the changing, unknown needs of the future with a simple reconfiguration of the office’s layout, convertible by the build. For more context on how flexible office design came to be, we can review the challenges and benefits of both a closed and open office floor plan — as this will help us understand how a flexible floorplan plan delivers most powerfully and more effectively than either. Why the closed, private, cubicle-style office design didn’t cut it. A closed office space is your traditional-looking office, with departments and hierarchies denoted by a deliberate arrangement of cubicles and private offices. The benefits and challenges are clear-cut and widely known. For an easy visual, think of the classic film, OfficeSpace. Improved privacy Having a dedicated, enclosed workspace gives individuals a dignified level of privacy and a sense of autonomy over the pace and focus of their work. Alienating Being cooped up and ‘closed in’ in a cubicle all day has the effect of making one feel isolated from both their team and the larger vision. Distraction-free Less noise, ongoing communication, eyes looking onto your work, and generally distracting stimuli around you equates to less distraction and greater ability to focus — this quiet, calm space is critical for deep, creative work. Expensive Given the infrastructure needed to create separate workstations, dividing partitions, and private offices, closed-office plans come at a sizable overhead cost. Improved productivity Productivity improves when concentration is easy. Space-inefficient Cubicle farms tend to be space-inefficient, as each cube has dead space within it, unutilized. At the other end of the spectrum of commercial office design exists the ‘open office plan’ — a proposed remedy to the stuffy, antiquated, isolating, and hierarchically-defined closed office layout. An open or ‘collaborative’ office plan is characterized by the use of wide, open space with no high dividers, wherein employees work side-by-side, often, at large, shared, collaborative workstations. Without those physical walls, barriers, and partitions (in the form of cubicle spaces and private offices) to divide teammates, an open office arrived with the chief promise of unleashing ad-hoc collaboration and communication for a more organic team interaction and, ultimately, greater productivity. Even for those who’ve not worked in this style of office, the pros and cons can be intuitively understood. Cost-effective, efficient use of space Because more employees can fit into an open office layout, and the installation of partitions and individual desks is not needed to complete one, they are a relatively a cost-effective, efficient use of space. Anxiety from being on display A sense of being ‘on display’ at all times can induce stress and anxiety — many people who work in open offices feel they’re being monitored more heavily by colleagues and managers, pressured to ‘appear’ busy at all times, with the lack of privacy afforded by partitions. This stress can verge on paranoia, greatly inhibiting deep focus and reducing productivity. Can improve team camaraderie The open, fluid layout lends better to spontaneous, chance encounters with teammates from other departments — a term coined ‘culture-collisions’ — which breeds relationships, sparks spontaneous conversations that breed creativity and contributes to a healthy sense of community and connection. Difficulty focusing Increased noise levels, lack of privacy, and working nearly shoulder-to-shoulder to colleagues with numerous devices going off is distracting. Calls and conversations can be overheard from across the office, and movement from colleagues can cause over-stimulation, making it exhausting to impossible to find focus. There is even research proving that stimulation overload in the form of distractions at work can be emotionally exhausting, detracting from the day’s output. Brings in the natural light Without any high-dividers to block it, natural light disperses well within open offices, improving employee morale through the connection to nature. According to our Work Life Awareness survey, 69% of people applying for a job look for natural light within the office — 82% saying natural light enhances their productivity. More digital interaction weakens effectiveness of communication Face-to-face interaction is proven to generally decrease within open-plan offices, which hinders quality communication and important opportunities to develop trusting relationships. Works to remove ‘barriers’ between employees and managers (freed from hierarchically assigned office spaces). By physically ‘flattening’ the organization, more effective team-wide communication is cultivated. When the goal is free-flowing creative ideas and information, this benefit is big. Open office plans don’t support completion of certain high-level work tasks Tasks that require a great degree of focus, such as coding, writing, or graphic design, are difficult to complete in an environment fraught with the distractions of various kinds of stimuli. The perfect balance of quiet, dedicated spaces for deep focus, and vibrant, communal spaces for restorative collaboration is central to flexible office design. This hybrid style of design, if implemented well, also incorporates ancillary spaces with equal share as it does these dedicated and shared working spaces both, in order to unbridle for the healthy benefits of relaxation, social connection, and comfort to be fully realized. Through such ancillary spaces, deeper relationships are fostered as well as a wholesome sense of place — one that allows one’s best frame of mind for quality work. Ancillary spaces are those “in-between” spaces in the office that allow workers to retreat and relax — the patios, eating areas, and meeting areas with non-work-related amenities. Because the modern office is expected to support well-being, these spaces, once considered of secondary importance to areas devoted to work, are now recognized as of equal importance. Consider the value of completely unplugging from one’s work to find the perspective that develops it through exercise at an on-site gym. Or the sense of joy and presence restored by a patio lounge lined with lush greenery; joy and presence that reduce stress, allowing one to ground themselves more attentively in their tasks with a new calm. The overdue trend in modern office design puts such ‘ancillary’ support at the core where it belongs. What characterizes flexible office design? A flexible workplace is one that is built with the chief aim of just that: flexibility. Flexible, most immediately, in responding and adjusting to the varying needs of each individual worker, per their unique array of work tasks, patterns, and styles throughout each day and day-by-day. As measured according to our Work Life Awareness survey, a ‘dream’ workspace layout includes both an assigned desk and flexible work options to 47% of employees. And flexible also in being capable of responding and adjusting to the needs of the future; an office built essentially with high-quality and versatile moving parts makes any office move or reconfigure down the road to be resource-efficient (in time, money, and energy). Building this flexibility right into an office space that properly features those powerful, regenerative ancillary areas ensures that the space meets its aim of housing and developing a happier, healthier, and more productive force of workers. Fundamental to the flexibility of each of these pieces is the easy adjustability that allow — either free-standing or easily disassembled, maneuverable, mobile, and properly customized with built-in casters, wheels, cranks, lifts, and mounts. These design features make the ‘flex’ between working solo, working collaboratively, and kicking back effortless. Because this easy ‘flex’ between work and relaxation is a fundamental goal (i.e. building ancillary into the office), products that combine work and play fit the bill perfectly. Take our #NETworking 5-in-1 Ping Pong Conference Table as an example, which changes shape to accommodate sitting or standing solo work, small group collaboration, and/or a stress-reducing game of ping pong. The Edge, called the world’s smartest and greenest office building, achieves efficient use of space with its app-powered, hot-desking protocol — and overall efficiency with its solar panel covered roof that services the building in generating more energy than it consumes. The space is flooded with natural light (with every workspace within 7 meters of a window), fulfilling environmental, ergonomic goals that make for happier people. The game rooms, coffee bars, and gym on-site satisfy inclusion of ‘ancillary’ areas critical to a flexible, modern office. And the walls are lined with flat-screen TV’s that can be easily connected to for content streaming, allowing that flexible, easy leverage of technology. The building, a superb incarnation of flexibility, efficiency, and ‘smart,’ is complete with custom-designed conference tables, meeting tables, and seating models. The flexibility of Unilever’s headquarters is absolutely manifest in the variety of zones, each denoted appropriately and built to embrace and advance a variety of work and relax tasks: ‘Focus Zones’ for concentrated work, ‘Connect Zones’ for collaboration and communication, ‘Vitality Zones’ for socialization and revitalization, and ‘Quiet Zones’ for improved comfort and well-being. The variety of flexible, modular furniture completes the team’s vision of giving ample room to productivity in all its forms, with ‘agility’ clearly defined as the object of the space’s build. Credit Suisse’s Zurich office aims to embody Smart Working by leveraging technology for both flexibility and a hardy respect for individual preferences. This two-pronged emphasis can be noted in the array of spaces built to support diverse activities across work, play, and relaxation. 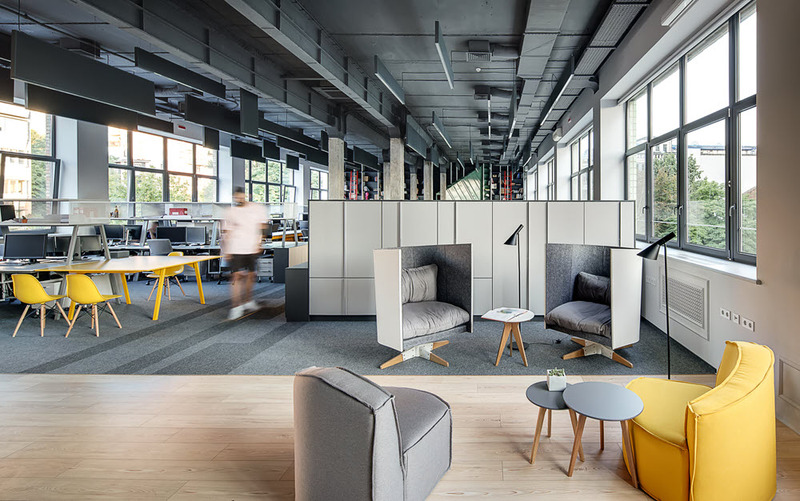 Note the clever use of breakout spaces, modular, adjustable furniture and equipment, games, cafe areas, huddle pods, comfort-giving work lounges, individual workstations, accessible technology, and versatile meeting spaces. W.L. Gore’s Elkton office — fit with a healthy amount of breakout spaces, enclaves, and lounge areas — does an excellent job of bringing the ‘home’ to the office through the incorporation of ancillary areas. By the same token, the variety of non-assigned workspaces made available and accessible through modular, adjustable, and versatile furniture succeeds in achieving the activity-based workspace sought through its design. A truly flexible workplace elucidates the awesome and important role that ‘custom’ plays in the creation of a multi-use space. Here, ‘custom’ can be seen as the key to solving both the functional and aesthetic goals, while fulfilling the more ethereal brand-related and culture-related goals as exhibited in the stories of these client spaces. How, exactly? By honoring the most defining finishing touches of a space: the details. Whether maple butcher block top or hardwood walnut, beige or calcutta marble laminate, or an A, V, Cone, or Eiffel frame table base — it is through the details that the vision, both abstract and concrete, is brought completely to life. And attention to the details is our team’s specialty — we co-create custom furniture with your team at a rate and timeline comparable to that of standard furniture delivery. From ideation to installation, our team partners on your project for custom, original furniture when ready-made pieces won’t satisfy. Want to learn more about co-created office design? Contact your Formaspace design consultant to get started on your first custom furniture project today by contacting us. https://formaspaceoffice.com/wp-content/uploads/2018/04/open-office-design.jpeg 626 1000 Mehmet Atesoglu https://formaspaceoffice.com/wp-content/uploads/2017/05/FS_office-full-mint-logo-300x62.png Mehmet Atesoglu2019-03-27 22:51:182019-03-27 22:51:18The Flexible Office Is the New Trend? Orgatec 2018: American & European Office Design Trends Converging or Diverging? What’s the Key to Signature Work in Office Design?